My version of the fermented menma bamboo shoots you find topping ramen in restaurants. When I first had ramen noodles in restaurants I couldn’t work out what the difference was between the crunchy, tasty menma served on top of the ramen and the tins of bamboo shoots I was buying for my homemade recipes. 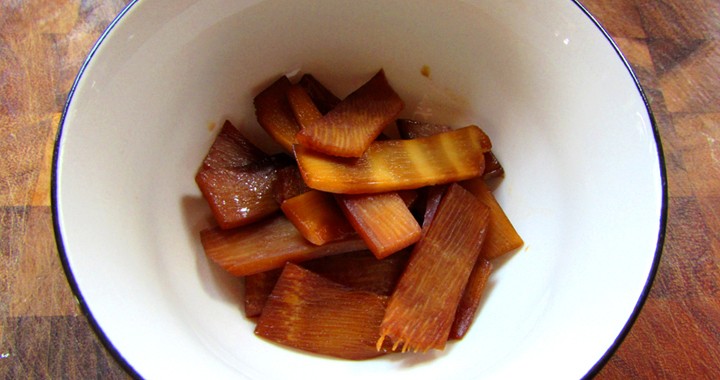 Menma are fermented bamboo shoots with seasonings, giving them a salty, umami favour. I was unable to source these and started trying to recreate them in the kitchen myself. Bring the bamboo shoots to boil in water in a small saucepan. Then drain, fill with fresh water and repeat. This will remove the chemical smell of the bamboo shoots. Drain in a colander. Heat the sesame oil in the same saucepan. Add the bamboo shoots, stir fry to cover in the oil and then add the soy sauces and rice wine. Cook for several minutes to allow the flavours to infuse and the liquid to reduce a bit. The bamboo shoots will take on a dark colour from the liquid. Remove from the heat. Keep warm until ready to serve and then remove from the liquid with a slotted spoon. Posted in Recipes, Toppings and tagged Bamboo shoots, Toppings.